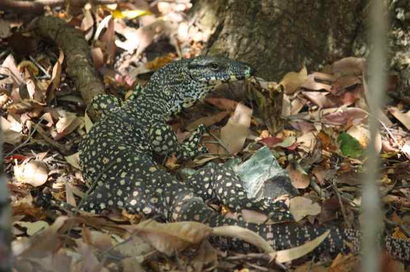 Working on the principle that I didn’t want to alarm a metre and a half of goanna I stayed pretty well where I was, on the off-chance it might still be in the vicinity when Madam made her way back towards the car. A call in that direction would probably, I figured, have only succeeded in persuading the goanna to light out for quieter environs. A conversation at normal speech level drew her attention to the reptile, and we spent another couple of minutes as Madam gave her camera another workout. Then it was time for the major strategic decision of the day. That is, and to wit, the sequencing of lunch vis a vis shopping. We’d taken our time setting out, and hadn’t hit the road till close to eleven, so if we were going to attack the shops first we’d probably end up having a late lunch, which would then have implications for the evening meal. In other words, lunch won. There’s usually a problem finding a park in Airlie (assuming you’re not looking at a walk) and the situation was complicated by the fact that the Port of Airlie construction had sprawled across what used to be public parking space, but we found a spot without too much trouble and set off in search of food. Passing Capers I had hoped that the management had seen the light and restored the old tapas set-up, but that hasn’t happened. You can still order individual items and make up something similar to the old platter that way, but it looks like there’s a substantial price lift, and it’s not the same as having the waiter consult the notebook and rattle off a succession of things that you can react to on a Sounds good basis.